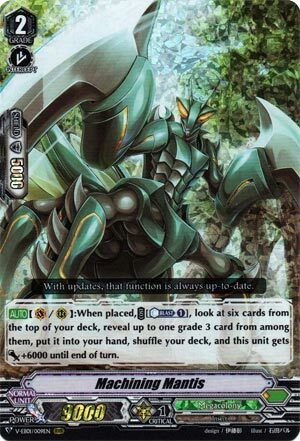 [AUTO](VC/RC):When placed, COST [Counter Blast (1)], look at six cards from the top of your deck, reveal up to one grade 3 card from among them, put it into your hand, shuffle your deck, and this unit gets [Power]+6000 until end of turn. I’m not big on spending resources for unsure advantage. Having said that the scaling for Force vanguards is probably worth the counterblast cost and at least it can maybe fix a Grade screw. It hasn’t got a lot of utility apart from that unless you have Spark Hercules and Stag Beetle for days to reuse it. But what can you do? It does a thing and does it decently.